for he, a man, sought to become a god. and God came to become a man. “he has become a god”??? Poor theology! I understand St. Ephrem to be speaking of theosis as expressed and grounded in the patristic tradition. 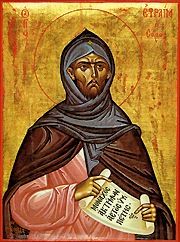 St. Ephrem neither merges humanity with the Godhead nor sets divinized humanity equal to God. Humanity is divinized solely through grace. I always seem to struggle with the word ‘divinized’. I know its provenance but there is still something that jars in me when I hear the word. Yet, I don’t struggle with the word ‘holiness’ – and yes, solely through grace. I guess it must be a cultural thing. We are quite a bit removed historically and culturally from St. Athanasius of Alexandria who wrote, “God became man so that man might become god.” Perhaps that is why Garth thinks it could be poor theology. We are so imbued with the reformers ways of thinking that it is sometimes difficult to bridge that gap and grasp the depth of the teaching of the early Church fathers. Kath, I agree there is some cultural distance but I think Tradition transcends that distance. Seems we often try to make the Church, Tradition, and doctrine relevant to us today when maybe we should be making ourselves and our world relevant to the Church, Tradition, and doctrine. Thank you for your thoughtful comment. It highlights for me the need to more fully recover the patrisitc tradition. Stefan, thank you for joining the conversation. I think we are in agreement and my earlier comment may not have been clear. I understand theosis to be a real union between humanity and God. I disagree that it is a merger only to the extent that “merger” suggests there is one nature or a confusion of the human and divine natures. Within the Incarnation there is complete union but the natures remain distinct though not separate. Seems to me that a key to understanding theosis is that humanity becomes divine (god) by grace whereas God is divine by nature. I hope you will conintue to read the blog and leave comments. Good post. The history of Syriac Christian asceticism has sometimes been harshly criticized. Thx for this. John Wesley loved St. Ephrem, though Westerners probably have preferred language such as holiness, sanctification & perfection. Keith, thanks for your comment. I did not know that about Wesley. Hm. Definitely one’s perspective on theosis is important to our overall web of theology. Hence, The “Web of Theology” assessment should have that as part of their assessment. Mike, do you have any writings on the diversity of perspectives on theosis that could be incorporated into the tool? Daniel, thank you for reading the blog and leaving a comment. Norman Russel’s book, Fellow Workers with God (http://bit.ly/brIM3j) provides a good introduction to theosis. I hope you find it helpful. If I recall, I think Anselm suggested that through the crucifixion Christ restored humanity to it’s original state, and through the resurrection elevates us to share in God’s identity & character. Josh, to be honest I am not sure how Anselm fits with theosis. I need to think about that some more. I do agree there is a connection with theosis and the liturgy. Humanity is to be the “priest of creation” uniting it and referring it back to God. Thus, theosis is not just about humanity but the reconciliation of all things. Another excellent book on theosis is Partakers of the Divine Nature, Michael J Christensen and Jeffery A Wittung, eds, Baker Academic 2007. It contains about 20 essays on the subject by both Orthodox and western Christian scholars. Among other things we learn about deification in the writings of Luther, Wesley, and, God help us, Calvin. For us Christians, Jesus is the highest authority and his words carry more authority than any theologian past, present or future. In theology we need to be very careful about the words we choose, their connotations and denotations, their explicit and implicit meanings. Nowhere did Jesus use the words “divinized humanity,” and he was definitely monotheistic, not employing phrases like “a god.” These words and phrases are very misleading and all too easily confuse people into believing erroneous doctrines regarding humankind and God. Thank you for your follow-up comment. When we speak of God I think we say more than we actually know or understand of God and less than who God really is. So I agree that we need to be very careful and intentional in our theology and teaching. This raises an issue which I think may lie at the core of this conversation – the relationship of Scripture and Tradition. Forgive me if this is presumptuous or incorrect but my sense is that you may learn towards sola scriptura while I view Scripture in relationship with Tradition. In the end I have faith that God is bigger than either approach. Holy/Divine/ Jesus calls each of us to “follow Him” as He did in so many instances in the Holy Scriptures. So, would this transfiguring event, point to “divinized humanity” towards which all true followers of Jesus, the Christ are called? nun Helen, thank you for this insightful comment. I think you are correct that the Transfiguration points to divinized humanity. St. Gregory Palamas, in speaking of Peter, James, and John, said, “They were changed, and so they saw the change” in Jesus. The disciples were permitted to see the deification of the human nature of Christ because they themselves were transfigured. Thank you for reading my blog. I hope you will continue to offer your comments and insights. 40 Days! each moment, each day with Our Lord Jesus Himself, the Way, the Truth, the Life, the Light! “Divinity shining through”! Thanks, for sharing this Hymn. I am curious, which one is it and is the translation yours? Thank you for reading my blog and leaving a comment. I am glad to have found your blog and look forward to reading your posts. The quotation from St. Ephrem is a portion of his Hymns on Virginity, 48:12-15. The translation is Sebastian Brock’s from his book, The Luminous Eye, p. 152-53. Another translation of that same hymn may be found in Ephrem the Syrian – Hymns (p. 454-55) in the Classics of Western Spirituality series.